“With our trade fair presentation this year, we are unders-coring the great significance of the VDMA’s BlueCompetence initiative, in which we are involved as a partner company, and are showcasing our high-performance extrusion solutions, which enable responsible use of existing resources”, states Jürgen Arnold, the company’s CEO, in presenting the motto “leading solutions for high performance & energy efficiency” of battenfeld-cincinnati, Bad Oeynhausen/Vienna, for the K 2013. “The merger of the two companies and consequently uniformity in their product range as well as processes and IT concepts has been implemented successfully and effectively. As a result, the entire product portfolio is no more than three years old, and since both companies have been concentrating on energy efficiency and sav-ing resources since the middle of 2000, the machine solutions are the state of the art today in terms of energy and water consump-tion, as well as material savings. To substantiate this claim, battenfeld-cincinnati’s three Divisions Construction, Infrastructure and Packaging will present extrusion solutions which operate energy-efficiently, save material and con-sequently offer their respective industries the best possible cost/benefit value. Of course, battenfeld-cincinnati’s customer support is focused on cost/benefit value for the entire life cycle of the equipment. In addition to normal service, battenfeld-cincinnati places special emphasis on upgrading extrusion equipment by op-timizing energy consumption and improving anti-wear protection to ensure consistent performance. This year’s highlight of the Construction Division is the piggyback extruder solution consisting of a parallel twinEX 78-34 P and a conical conEX 63 P extruder. 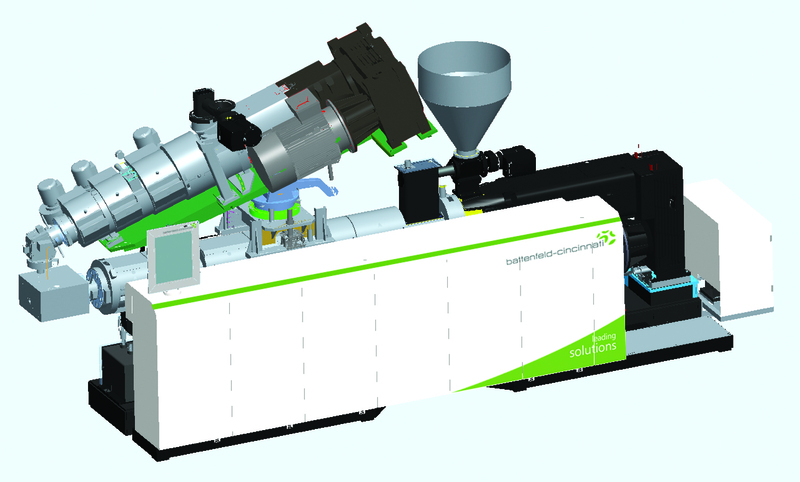 With this compact machine configura-tion, the machine manufacturer caters to the growing trend to-wards using more recycled materials in the window profile industry. For both ecological and economic reasons, up to 40% regrind is used today in window main profile production in non-visible areas. The machine combination on display is laid out for a throughput of up to 500 kg/h. Like all extruders from battenfeld-cincinnati, both extruders are equipped with energy-efficient AC motors, Intracool screw core tempering and fully insulated barrels with intelligent air cooling. The piggyback solution is the answer to the BlueCompetence demand for material savings. At the same time, the extruder combination is extremely user-friendly for connecting extrusion dies, thanks to the coextruder’s flexible frame design. The equipment’s user-friendliness is further enhanced by a common control cabinet, one control unit serving both extruders, and a central plug, by which the die can be con-nected quickly and easily and without the risk of errors. The Infrastructure Division is rolling out a new machine series for this year’s convention of the plastics world in Düsseldorf. Only three years after the premiere of the new solEX high-performance single-screw extruder series, battenfeld-cincinnati is now presenting the solEX GL (gearless) series. The four models of the new series with screw diameters of 45, 60, 75 and 90 mm stand out by their excellent product quality, achieved with low melt temperatures’, low energy input and an optimal capital/output ratio. These machines also operate with a new drive concept to fit in with BlueCompetence. The high-torque motor used operates more energy-efficiently than a combined motor-and-gearbox drive sys-tem. Additional benefits of the new drive are low noise and vibra-tion levels and virtually no maintenance requirements. Through dispensing with gears, the design of the new extruder has also become even more compact, so that high performance is offered with a minimal footprint. The Packaging Division also emphasizes the significance of Blu-eCompetence with its exhibits by presenting extrusion equipment which enables energy and material savings while still providing high performance. The high-speed single-screw extruder on display with a screw di-ameter of 75 mm and a 40 D processing length requires up to 25 % less energy compared to a conventional extruder with equal performance. 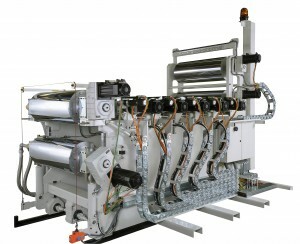 This extruder also ensures optimal melt attributes in the production of film from a great variety of materials, including PS, PET, PP and EVA and even coextruded products. The processing machine reaches outputs of up to 2,000 kg/h with a minimal foot-print. With its Multi-Touch roll stack, battenfeld-cincinnati is presenting a new product which offers gentle treatment of materials and simul-taneously saves energy. Thanks to a special combination consisting of a 2-roll roll stack for preliminary calibration and a larger number of rolls for final calibration, this roll stack enables the production of stress-free film at high line speeds with an accuracy of 1 %. Thanks the use of thin-walled rolls, Multi-Touch is also extremely energy-efficient. With all of its other machine concepts, the Packaging Division also targets resource-saving solutions, which simultaneously cater to specific customer demands. For example, battenfeld-cincinnati has developed a new anti-wear concept for planetary roller extruders, which are being used for applications such as calender feeding and pelletizing. With the new L+ planetary spindles, uptime can be increased by 30 to 50%, which also leads to a reduction in steel consumption and workloads. For the PET industry, battenfeld-cincinnati will showcase its specia-lized single-screw extruder with an integrated compounding section for outputs between 500 and 1,000 kg/h. With this extruder, up to 16% of energy costs can be saved by processing undried PET and thus dispensing with preliminary material drying. The Division is also presenting a project in the area of plastics re-cycling. Over the last few months, the existing granulating extruder series has been completely revised. In addition to the extruders, which were mainly energy-optimized, special attention was paid to the downstream equipment. Here modules have been created which optimally match the lines’ performance range. This is one of the main reasons why Metal-Plast, a leading Polish PVC processor, has chosen a repelletizing line from Bad Oeynhausen for the fifth con-secutive time.